SSG Charles “Chuck” Sanders was born in Missouri on November 4, 1975. 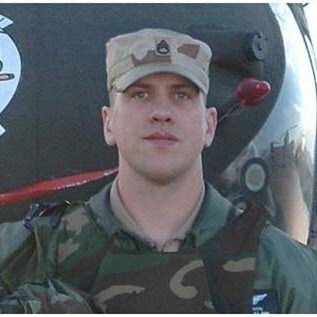 Chuck enlisted in 1995 in the U.S. Army as a CH-47D Helicopter Mechanic. He continued to serve his country achieving the rank of Staff Sergeant, and ultimately became an Assistant Platoon Sergeant and accomplished Flight Engineer. From November 1995 to April 1998 he served in Fort Wainwright, Alaska. He stayed on for a second tour in Alaska, then moved to Giebelstadt, Germany in October 2004. Chuck was quickly integrated and welcomed as a member of the team upon his assignment to F Company, 159th Aviation Regiment “Big Windy”. He brought with him vital knowledge and skills that helped prepare his new unit for its deployment to Bagram, Afghanistan in support of Operation Enduring Freedom. Chuck enjoyed the outdoors, and especially enjoyed his time serving in Alaska. Chuck is survived by his wife Gwen and their two children, Drake and Sydney. Chuck was a quiet professional that didn’t like all the fanfare, but chose instead to enjoy life amongst his friends and colleagues, and above all sharing it with his family.